There is something both exhilarating and scary about releasing a new book to the world (or maybe it’s just me), and more so when an author is concerned because I want their book to shine above the other new releases, and continue to do so. Months of preparation goes into every book as it goes back and forth between the editors and the author, but that is the ‘easy’ part of the process. Marketing is the tricky bit — letting people know that your new book is out and about in the world, seeking readership and reviews. Today is the turn of Star Shepherd, the first book in the Shepherd of Light space western series by two-time dragon award-nominated and Nebula-nominated author, R.R. Virdi. It tells the tale of Star Shepherd, charged with the delivery of a mysterious package that could turn the tables of power in favour of the common people. I don’t want to say too much about the book in this post because we have a fabulous blog hop running over the next ten days, with each host publishing unique content (there’s an Amazon gift voucher up for grabs too). 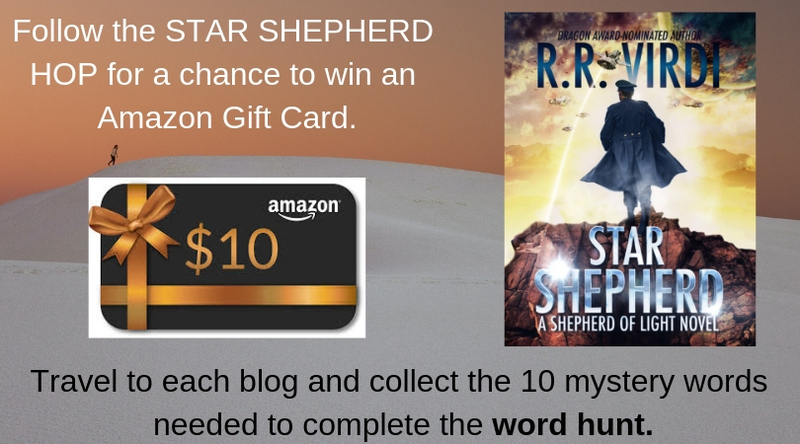 There are a lot of different thoughts running through my mind as I write this, and I’ll begin with the thank yous’ – to the author of Star Shepherd, R.R. Virdi for entrusting me, well, Bolide Publishing, to do right by his new book. To Black Cat Edits and AnnaProofing for their time and expertise in content and copy editing, and to Sarah Anderson of No synonym for the wonderful cover. I would also like to thank the readers who requested advance copies and in particular to those who are in the process of writing and uploading their reviews, and to Author Assist for organising and managing the blog tour. As for me, I’ve loved this story from the first I saw it and have had a lot of fun doing the initial edits, reading and re-reading it, and working closely with R.R. Virdi to get it into the best shape we can. And now the fun of editing, preparing, and uploading is complete, nerves and anticipation are kicking in as I broach the subject of marketing, which (I believe) can make or break a book’ success. I’ve read widely about book launches, promotions, and have even signed up for a couple of courses (the Mark Dawson courses to be precise). I’m pretty good at the theory (recalling facts, figures, and details) but struggle a little with the practical. I don’t think it helps that I’m quite a shy, reserved person and don’t like to brag about anything, but that’s a personal trait I need to get over (for marketing purposes, at least). What I do have, though, is the utmost faith and belief in every book I have published, and it is my hope that readers enjoy these stories as much as I have. I’ll finish this post by wishing R.R. Virdi the very best of success with the launch of Star Shepherd – I hope it does as well as you and I believe it can.